Singapore’s French fine dining restaurant Odette has usurped Bangkok-based restaurant Gaggan to become the best restaurant in Asia, named by Asia’s 50 Best Restaurants, a title that Gaggan had held for four consecutive years. Led by chef Julien Royer, Odette is the first Singapore restaurant to take the top spot in Asia’s 50 Best Restaurants List. Housed in the National Gallery Singapore, Odette serves Asian-inspired modern French cuisine. Taking its name from Royer’s maternal grandmother, Odette earned Asia’s Highest New Entry Award in 2017 before debuting on the World’s 50 Best Restaurants List at No. 28. Gaggan, the progressive Indian restaurant, moved to No.2 while retaining the title of The Best Restaurant in Thailand. The 2019 list features 10 new restaurants, including two first-time entries from Hong Kong: Vea (No.34) and Seventh Son (No.44). Hong Kong counts nine restaurants on the list, including The Chairman (rising from No.22 to No.11), 81⁄2 Otto e Mezzo Bombana (No.12), Amber (No.21), Neighborhood (No.37), Lung King Heen (No.38) and Ta Vie (No.50). Soaring 25 places to No.15, modern French bistro Belon is crowned with this year’s ‘Highest Climber Award’. Host destination Macau counts two restaurants with Jade Dragon rising eight places to No.27 and Wing Lei Palace debuting at No.36. The 2019 list reflects the diversity and vitality of the ever-evolving Asian gastronomic scene, including a first-time entry from Malaysia (Dewakan, No.46) and a new restaurant in the Philippines (Toyo Eatery, No.43), a country last represented in the list in 2017. Japan leads the 2019 list with 12 entries. Fronting this group is Den (No.3). 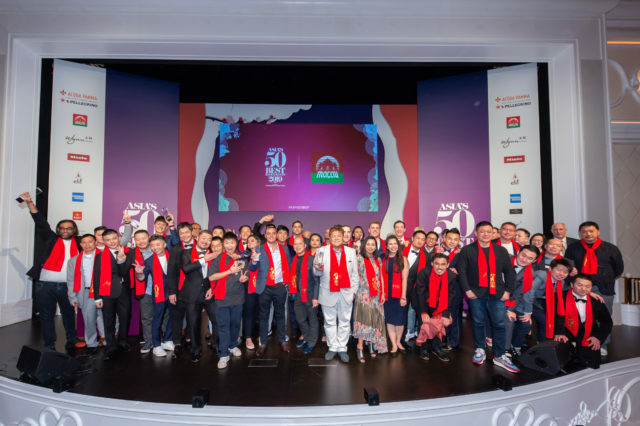 Its chef, Zaiyu Hasegawa, was also rewarded for his innovative approach and named the 2019 recipient of the Chefs’ Choice Award, the only award voted for by the chefs of the Asia’s 50 Best Restaurants. The results were announced on 26 March at Wynn Palace in Macau. Odette has made Singapore proud! Finally! Bravo!